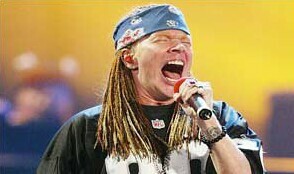 I have poked fun at Axl Rose over the years for his many tantrums. But Axl's latest diva move has left me with my jaw dropped. After reading the news on Hollywood reporter, I quickly had to see if it was April 1. Axl Rose has just filed a $20 million lawsuit against Guitar Hero maker Activision claiming its use of the GNR song "Welcome to the Jungle" violated a deal not to include any imagery of ex-guitarist Saul Hudson (aka Slash) in the popular game. Axl and reps setup the deal with Activision to use the song in the game along with band logos etc. What they didn't license through Axl Rose was the use of guitarist Slash's image. For that, they cut a deal directly with Slash. In an amusing lawsuit filed in Los Angeles Superior Court, Rose and his Black Frog Music claim that Activision Blizzard fraudulently induced Rose into authorizing "Jungle" for use in Guitar Hero III by telling him during negotiations that it wouldn't feature any reference to the former GNR member or his subsequent band, Velvet Revolver. "[Activision] began spinning a web of lies and deception to conceal its true intentions to not only feature Slash and Velvet Revolver prominently in Guitar Hero III but also promote the game by emphasizing and reinforcing an association between Slash and Guns N' Roses and the band's song 'Welcome to the Jungle,' " the complaint states. Rose claims that when he found out that a Slash-like chararacter and Velvet Revolver songs would be included in Gutair Hero, he immediately rescinded the authorization for "Jungle," but Activision allegedly lied and told him the inclusion was just for the purposes of a trade show. The game later came out and featured "an animated depiction of Slash, with his signature black top hat, long dark curly hair, dark sunglasses and nose-piercing," according to the complaint. In short, the former GNR guitarist was all over Guitar Hero III, enraging Rose. Rose also claims that the GNR song "Sweet Child O' Mine" was used in an online promotion for GH III despite being licensed only for GH II. He wants $20 million in damages from sales of the popular game. "This lawsuit is about protecting Guns N' Roses and 'Welcome to the Jungle' and is about holding Activision accountable for its misuse of these incredibly valuable assets," Rose lawyer Skip Miller says. "The relief we are seeking is disgorgement of profits and compensatory and punitive damages." Personally, I think Axl Rose is a very jealous man. Slash has moved on to bigger and better things and Axl is left with tanking album sales and projectiles being thrown at him on stage.